whole foods | Angela M.D. “Good health. Will America ever see or experience it again? No — not if we continue on our current path.The perfect storm of failing health and a failing health care system is upon us. We’re on a crash course with the collapse of optimal health in this country. The solution to reversing course doesn’t lie with the medical profession, medical system or some outside entity. It lies with each of us. All Americans must do what is necessary to protect their families and themselves. There is no other option. Here’s why. We’ve been addressing the urgent in our lives versus the important, often ignoring our own health in the process. We’ve delegated the role of educating and caring for ourselves to those who “know better.” We no longer trust our intuitive intelligence about what is necessary to sustain optimal health. That’s a growing concern because powerful forces are present that make and keep us patients and contribute to illness. These forces act to limit the available facts necessary to travel the path to health. When raw milk produced under sanitary conditions is illegal while thousands of chemicals, dyes and poisons are allowed into the food supply daily, there is a problem. Next, consider this. The body of scientific research clearly demonstrates the path to health — yet, the conclusions are frequently skewed by opinion, financial motives and government regulation. Publication bias demonstrates that research studies with positive findings are published while studies with negative findings are hidden from public view. Evidenced-based medicine sounds good in principle, but when the evidence is often flawed or skewed by statistical manipulation, there is little benefit to the findings. Bottom line: Our current research system is not always set up to find the absolute truth, but often to demonstrate a positive result supporting the use of a drug. Our medical system is not designed to prevent disease. The current system is primarily based on managing and treating disease, not necessarily preventing or curing it. We have worshiped at the altar of medicine for too long and need to question its fallibility if we are to improve the system. The cure for many modern diseases is possible, but the current state of medicine is not structured to support it. We focus too much management, as if cure is not possible. Physicians are often reticent to admit or even consider the possibility that there is something beyond what the medical profession teaches. Asking the current medical system to cure disease is similar to asking the government for advice on the best way to save money and reduce waste. When a system encourages the consumption of medication, but doesn’t encourage the consumption of vital and necessary nutrients, there is work to be done. We need a marriage of science, medicine and facts to guide us in the right direction. You cannot medicate your way to health. Promoting health while ignoring prevention is no different from rearranging the deck chairs on the Titanic. Soon, we all will have access to care—but if it is poor care, are we any better off? What you need to know. Good health occurs by addressing the following five areas. Each of these areas must be optimized to support and improve health. There are many key considerations when addressing these powerhouse five areas. Each serves as a starting point for maximized health. We are digging our graves with our teeth. The root cause of modern disease is based on the foods we eat. Our food supply is adulterated on so many levels that many of us go through the day consuming edible food-like substances rather than any real food. Unless we understand the value of eating real food, improvement will be limited. Superior health starts with the proper nutrition. Patients are frequently told that diet plays a minor role in disease, its improvement or progression. You cannot fully heal a part of the body without healing the whole body—and diet is a major part of that. Nourish health and disease will disappear as a side effect. When asked if it bothers me that I don’t eat like everybody else, my response is, “Not when I see how poorly everybody else is doing.” It’s time to grow up nutritionally. The path to health has been hidden for many reasons. It is incumbent upon us to uncover the path and do what is necessary to reclaim our right to optimal health. It’s not difficult. It’s merely a change of mindset. Change your mind and the body will follow. It all starts with the brain. There are numerous resources available for those interested in creating an abundant, healthy life. Dig deeper, uncover the truth, find a trusted confidante and share the journey. Health multiplies everything, better relationships, more confidence and more peace. Continuing to rely on and follow the many established consensus thoughts and opinions on health will lead to more of the same. Trust the innate wisdom of our grandparents and ancestors prior to the introduction of modern, industrialized food. You’ll live a better, healthier life, not one subject to modern disease, many of which are becoming more prevalent in our society. I love V8 Juice–my mom made me drink it every morning before school. (Thanks Mom). It was the perfect combo to my usual breakfast of chocolate donuts! I think of the commercial “I should have had a V8!” as I peel the little label off that can! This last weekend, the kids and I went on a mission to reproduce a V8 juice using our new juicer. Don’t get me wrong– V8 from the store is incredibly better than soda or an artificial reproduction of a fruit juice. Please don’t feel judged if you do drink it–it’s a great choice. We just needed a project. It certainly became a project quickly (Imagine a 5-year-old cramming veggies in a juicer at lightening speed) and it turned into a real ordeal. It’s amazing that we survived with fingers and kitchen intact. Fooducate gives it a B rating so no–it’s not all that bad. However – please note the Maltodextrin, Salt, Flavoring?? ?, and Ascorbic/Citric Acid. in the ingredient label. That is way more ingredients than we like to see! TOXIC!. Maltodextrin is made from starch, primarily corn in the US . Maltodextrin applies to any starch hydrolysis product containing less than 20 glucose units. It serves as an artificial sweetener in most foods in which it is added. Tomato Juice From Concentrate (Water, Tomato Concentrate), Reconstituted Vegetable Juice Blend (Water and Concentrated Juices of Carrots, Celery, Beets, Parsley, Lettuce, Watercress, Spinach), Maltodextrin, Salt, Ascorbic Acid, Flavoring, Citric Acid. Here’s another great post from Dee!! As promised, here is an expanded narrative on focusing on what you can eat, instead of what you can’t. Let me start with an example of how one’s day goes on a diet. Let’s say there was a family gathering over the weekend and your neighbor’s half-eaten chocolate cheesecake was leftover in your fridge. You go to work on Monday with your cooler of veggies and mid-morning you start saying to yourself “I won’t eat that cheesecake, I won’t eat that cheesecake, I won’t eat that cheesecake.” After a nice, lunch of spinach salad and berries you start to think of your evening plans and again recite your directive of “I won’t eat that cheesecake…and on, and on. Guess what happens when you walk into your kitchen that night! You have practically brainwashed yourself on NEEDING to eat that cheesecake because it has been incessantly imprinted on your brain all day. Sounds like there’s nothing left to eat if I take away all of my favorite comfort foods. But let’s be honest. For the short list of what has to go away as I adjust to some better choices, here are some great things that I can eat: eggs, oatmeal, yogurt, pineapple, bananas, strawberries, oranges, kiwi, apples, blueberries, grapes, pomegranate, pecans, almonds, cashews, wheat tortillas, wheat pita, salsa, hot sauce, marinara sauce, spinach, avocado, tomatoes, sweet potatoes, eggplant, zucchini, cucumbers, tuna, turkey, chicken, salmon, ginger, tilapia, shrimp, lobster, filet Mignon. True story: yesterday I had nothing planned for dinner and started thinking that maybe my kids would like a pizza because when Mama diets the whole family diets. That pizza notion turned into thinking maybe I would make a homemade flatbread pizza with turkey pepperoni. 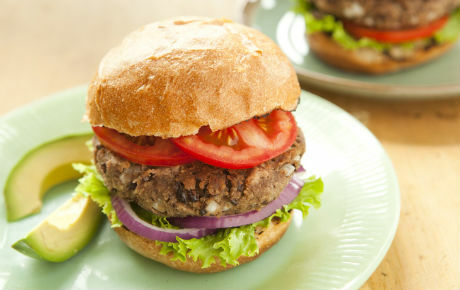 Then I thought maybe a turkey burger instead, no wait, a black bean burger on a bed of lettuce and tomato. By the time I pulled into the drive, I was actually craving a black bean burger and that’s what I had for dinner. It was delicious! Lucky for my kids and husband they had all gone out for Mexican before I got home. So in the last 3 weeks I have been putting on weight and belly fat like crazy. I didn’t figure it out till this morning when I was putting together this post on wheat—-Bingo (light bulb)– A few weeks ago I got the crazy notion to add some goldfish crackers on my salad at lunch. My obsessive compulsive habits had me eating those little heathens daily. Despite eating primarily PALEO, that little bit of wheat has started that vicious wheat belly cycle all over again. Needless to say, I will be eliminating those today. So here is the part 2 of the dreaded wheat conundrum–wheat is a drug! Crack if you must. Mix all wet ingredients together first and then add in the dry ingredients, mixing well. Pour into a loaf pan greased well with coconut oil and cook for 75 minutes or until a toothpick or fork comes out clean (aside from melty chocolate ). Let cool before slicing and serving but it tastes best when still slightly warm. Enjoy!! HERE’S ANOTHER GREAT HEALTHY RECIPE—I MADE THIS FOR SIDNEY’S 13TH BIRTHDAY PARTY—please note the pinterest picture I copied and the actual picture of my dish—BAHAHAHA! 1. Roast the sweet potatoes: Preheat oven to 400 degrees. Chop the sweet potato into bite sized cubes. Drizzle with olive oil, salt, and pepper. Roast in the oven for 20-30 minutes.